Your Stupid Minds goes back to its roots (once again) with the first foray into Hollywood(ish) by former football washout Brian “The Boz” Bosworth: 1991’s Stone Cold! The Boz plays undercover cop Joe Huff (under the alter ego John Stone) to infiltrate a murderous, terroristic biker group led by Chains Cooper (Lance Henriksen). After some mild blackmail from the FBI, Huff/Stone goes undercover to bring a violent Mississippi biker gang down. After feeding his pet lizard (maybe a Komodo Dragon? ), he heads off to The South’s Warmest Welcome to meet Chains, second-in-command Ice (William Forsythe), old lady Nancy (Arabella Holzbog), and token wuss Gut (Evan James) to bring down their drug dealing and general violence. Stone gets in deep when he gets feelings for Nancy, and makes up some elaborate drug buy with a limitless supply of FBI drugs. Can Stone bring the gang down before their terroristic plans from to fruition? Will he get home in time to feed his lizard? Will Gut get the confidence he so sorely needs? Listen to find out! What underwear do bikers wear (if any)? If you're a biker, please let us know. Filmed in Mississippi, Alabama, Arkansas, and Florida. 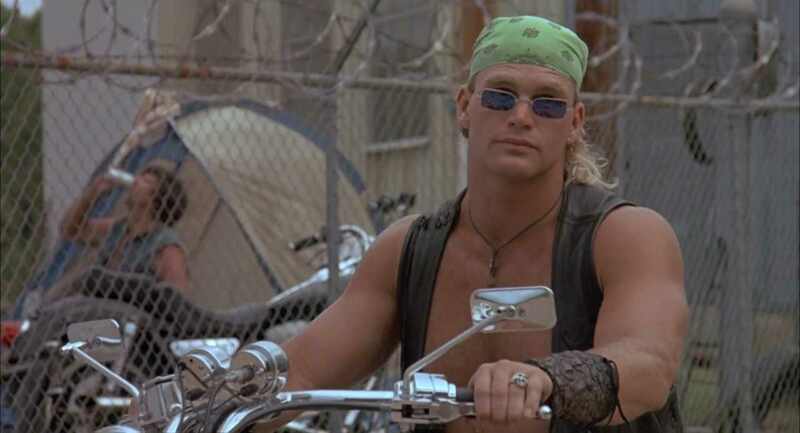 I said it in the podcast and I'll say it again, they should have made a Duke Nukem movie in the '90s with The Boz.